I’m not quite sure how, but I ended up with a massive amount of steel cut oats. Too many for one person that isn’t that huge of an oatmeal fan to begin with, so using them in baked goods seemed to be a good solution to cutting down on that massive container I have hanging out in the pantry. 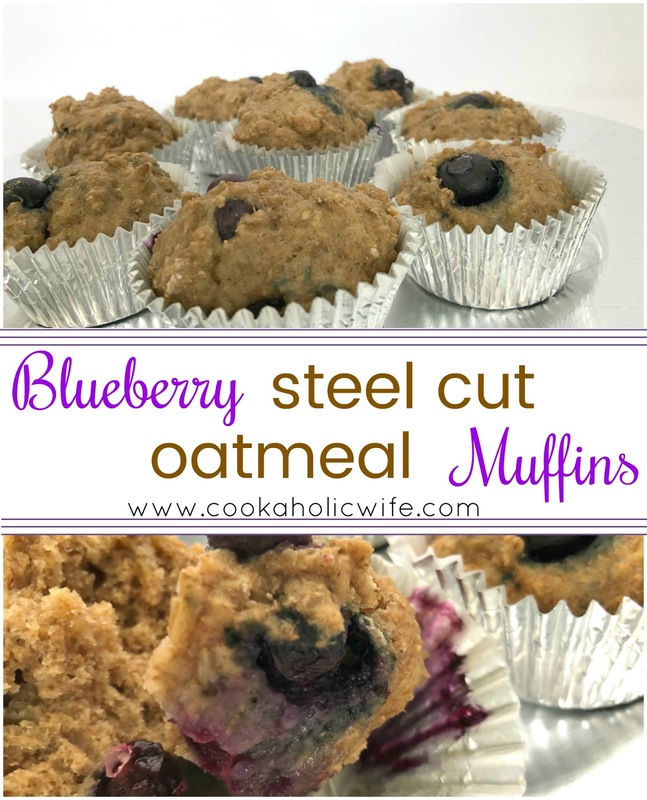 Blueberry Steel Cut Oatmeal Muffins are a filling and healthy choice for breakfast. Prepare the oatmeal by adding all of the oatmeal ingredients to a medium saucepan over medium high heat. Bring to a rolling boil, then reduce to a simmer, until the oats have absorbed nearly all of the liquid, about 12 minutes. While the oatmeal is cooking, preheat the oven to 375 and line cavities of two muffin pans with paper liners. In a medium bowl, whisk together the whole wheat flour, all purpose flour, baking powder, cinnamon, and baking soda. Set aside. In a large bowl, whisk together the Greek yogurt, applesauce, milk, coconut sugar, and vanilla until combined. 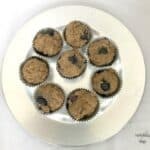 Scoop the batter into the prepared muffin tins, filling each ¾ of the way full. Bake for 18 minute or until golden brown and the muffins spring back lightly when poked. 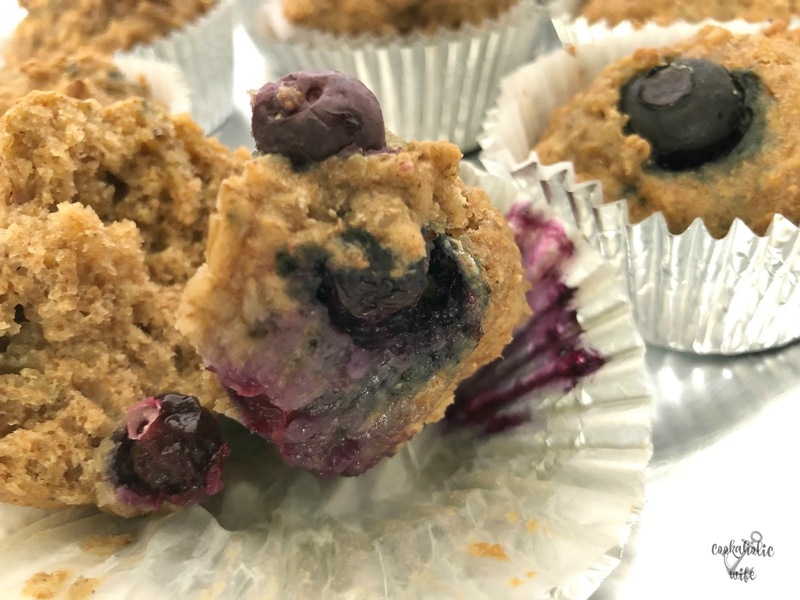 These muffins are not very sweet, but they are really hearty and filling and bursting with blueberry flavor. The oatmeal makes the muffins really dense but they’re not dry or chewy by any means. Love a hearty muffin and blueberry is CLASSIC!! I love blueberry muffins- looks like a great way to eat oatmeal to me! These will be great for breakfast! What a great way to use up all of those steel cut oats! I've used them in cookies too, and they worked out! i'm intrigued that you cooked the oats before baking the muffins. will have to try this! Nice idea to use steel cut oats in a baked good like this! These look delicious. Muffins are always a welcome addition in this house. They look good and hearty! I bet they would be delicious warmed up with a smear of butter.